Outside Parliament House yesterday, Prime Minister Voreqe Bainimarama. I rise to make a ministerial statement about the calls by the opposition for the Great Council of Chiefs to be restored. I want to explain to the nation why the Government opposed this on Monday. And I do so not only as Prime Minister but as the Minister for iTaukei Affairs and as a proud iTaukei myself. But before I do so, Madam Speaker I would like to take this opportunity to thank the well wishes for the celebration of my birthday yesterday (Wednesday) and to the Leader of Opposition for the kind words of support and of course to the Members of Parliament and the hundreds of Fijians who wished me well yesterday in celebrating my birthday, but just as we all know Madam Speaker, it is just another day in our lives. I care very deeply about this issue. Everything I do as Prime Minister is motivated by what is best for every Fijian, including the iTaukei. And I believe passionately that restoring the institution of the Great Council of Chiefs is not in the best interests of the iTaukei. And let me tell you why. First of all, I have to say that with all the suffering and hardship in Fiji at the moment, this was an astonishing petition and motion to put forward at the first parliamentary sitting since Tropical Cyclone Winston. Our people are still coming to terms with the loss of 44 of their loved ones, up to 40,000 of their homes either damaged or destroyed, along with 229 schools and other public buildings and infrastructure. Is restoring the Great Council of Chiefs in the least bit important at the present time? And yet this is what the opposition came here with on Monday – the very first motion at the very first sitting of the Parliament since Winston. Not to talk about our collective response to the present crisis or the rebuilding programme that lies ahead but to drag us all back into the past. Madam Speaker, those of us on this side of the House can scarcely believe that at this time, this is the priority of the Honourable Leader of the Opposition and those opposite. To try to breathe life into an institution that is long gone and an issue that is irrelevant when so many of our people are in such a desperate state. The Great Council of Chiefs was disestablished more than four years ago in March 2012. Why waste our time on this, 49 months later? Trying to revive an issue that has nothing whatsoever to do with the current needs of the Fijian people? To have made this your first priority in the Parliament since Cyclone Winston is an insult to our people, given their present challenges. Madam Speaker, it is nearly three months since the last Parliamentary session. We in the Government were hoping that during this hiatus, the Opposition would use the time to work out where it is going wrong. Heal some of its internal divisions. Come up with some answers as to why there is such a disconnect between its agenda and the needs and aspirations of ordinary Fijians. Only yesterday, the Opposition put the interests of a single company with three employees before the interests of about 900,000 Fijians. Madam Speaker, it is now more than nine weeks since Cyclone Winston devastated the country. Nine weeks in which the Opposition has had time to think about how it might contribute positively to the relief effort aside from its cash donation. And get behind the nation as we confront the great challenge we all face to rebuild Fiji. I seriously expected them to finally meet the challenge of being an effective Opposition instead of the ineffectual rabble they’ve become. And, Madam Speaker, rabble is the only word to describe the antics of members opposite, like the honourable Tikoca. Constantly interjecting. Nothing positive. No vision. No new ideas. No solutions. A rumbling, grumbling presence who constantly harps on about the non-existent threat to the iTaukei and threatens honourable members of this House. And in doing so, has lowered the tone of these proceedings to the same level as his voice. We naively thought that with their fellow Fijians in crisis, the Opposition would rise to the occasion and join us in the task of doing a better job of serving our people. Fresh ideas. Innovative suggestions. Bringing to this chamber at least a degree of brain power and common sense. Because you’ve all had ample time on your hands to think things over since Winston while we’ve had our own hands full, dealing with this crisis. Instead, you come here with something that has absolutely no relevance to the present needs of the Fijian people or their future hopes and aspirations. You want to breathe life into an issue that was settled in 2012. Not for the benefit of the Fijian people but for your own benefit. To try to restore the power and privileges of the elite and reassert political chiefly supremacy over commoner iTaukei and every other citizen. Madam Speaker, it is all so pointless. So unnecessary. Just think of what we have achieved as a nation in the four years since the GCC was abolished. We have a new Constitution that establishes this Parliament as the supreme decision making body in the country. And we have had the first truly democratic election in which almost 60 per cent of the electorate voted for change. Voted not for SODELPA which went around campaigning that a vote for FijiFirst would mean the loss of iTaukei land, iTaukei culture, iTaukei identity – but they voted for the FijiFirst Government to take our nation forward. Voted emphatically to stop raking over the old arguments of the past and chart a new course to give every Fijian a better future. When are the honourable members opposite going to finally wake up? When are you going to come to terms with the fact that you went to the nation with your politics of division and were rejected? When are you going to become an effective Opposition worthy of the name and do your job properly? When are you going to stop being obsessed with the past and turn your minds to helping Fijians create a better future? And by the way, when will the current NFP leadership develop a spine and confront the prejudices of SODELPA – prejudices that the founders of the NFP stood against? Madam Speaker, on Monday we had a conga line of Opposition MPs giving us a succession of history lessons. But it’s a sign of how much they’ve lost the plot that most of those lessons were factually wrong. So permit me, Madam Speaker, to give the members opposite a basic lesson in history that is grounded in fact. The astonishing claim was made on Monday that the GCC was an indigenous organisation stretching back to before colonial times. Wrong, Madam Speaker. It was established by the British in 1876 – initially as the Native Council – two years after our islands were handed over to Queen Victoria by Ratu Seru Cakobau and the other chiefs who signed the Deed of Cession. So GCC, the institution, is not indigenous at all. It was a British institution set up by our colonisers. And it was set up so the British could govern and control the indigenous population through the chiefs at that time. Madam Speaker, the British used the GCC to serve their own purposes. They had hereditary chiefs of their own – their dukes, earls, barons and so on. So they were very comfortable dealing with hereditary chiefs in Fiji. Not with troublesome commoners but people like them who owed their power to an accident of birth. People who could order everyone else to fall into line. Madam Speaker, this arrangement worked well for the British until they left Fiji 94 years later in 1970. But let’s not kid ourselves. The whole system was about control. The British, with the support of the chiefs, deciding what was best for ordinary Fijians whether they liked it or not. In fact, Ratu Sukuna’s father, Ratu Joni Madraiwiwi, opposed giving commoners the right to vote in the Legislative Council because he said the chiefs knew best what was good for the commoners. That they couldn’t think for themselves. Ordinary iTaukei didn’t get to vote directly for their own representatives until the general elections in the mid-sixties. So that was the mind set at the time – that the commoner iTaukei people had to be led by those born to rule because they were too backward to decide anything for themselves. Madam Speaker, times have changed but the mentality of the Opposition has not. They accept that ordinary iTaukei now have the right to vote but still think they are happier when they are told what to do and what to think by their chiefs. Whereas we on this side of the House, we respect the basic common sense and intelligence of the ordinary iTaukei. And uphold their right to be free of this mental straightjacket and make decisions for themselves. But let me finish the history lesson, Madam Speaker. After the British left 46 years ago, in 1970, the Native Council, which had by then had become the GCC, continued. Its members were guaranteed a certain number of seats in our old upper House – the Senate. And they enjoyed a degree of power and influence out of all proportion to their actual contribution to moving the nation forward. In the racist 1990 Constitution, this unelected group of hereditary figures enjoyed the right to choose our President and Vice-President. The claim was made on Monday that the GCC was a stabilising influence. If this is true, why did we have to go through the traumas of 1987 and 2000? Why did they allow the removal in 1987 of Dr Timoci Bavadra, the elected Prime Minister of Fiji – the first iTaukei commoner, the first ever non-high chief and, from the Western Division. The burning and looting of Suva. The shameful attacks on innocent people in 1987 and 2000. What did the GCC do to prevent that? If the GCC was such a stabilising influence, why did some prominent chiefs actively participate in these events and others support them? What did the GCC do to free Dr Bavadra and his cabinet colleagues from detention in 1987? What did the GCC do to end the siege of the Parliament in 2000 – the Chaudhry government locked up for 56 days? The whole nation was crying out for a stabilising influence from the GCC. But it merely stood by during these terrible episodes that set our nation back two decades. Madam Speaker, the claim was also made on Monday that if the GCC returns, it can preside over the process of opening up more iTaukei land for development purposes. But history again tells us otherwise. GCC members had the chance to secure the renewal of the leases on iTaukei land that expired during the 1990s and early 2000s. But they sat firmly on their hands. And that failure left many of our citizens dispossessed, robbed iTaukei land owners of the benefits those leases could have brought them and again retarded our national development. So Madam Speaker, there is nologic to the argument that if the GCC is restored, we won’t have any problems in Fiji. Instead of focussing on the most pressing national issues like job creation; education; infrastructure development; the empowerment of our youth and women; prudent financial management and economic growth, the Opposition gives us this needless sideshow. And wants to divert our attention away from the most pressing issue of all – rebuilding our nation after the devastation of Winston. Madam Speaker, the fact is that in the end, the GCC had become so politicised, so divisive, that it was a significant obstacle to improving the lives of ordinary Fijians. It was certainly a major obstacle to the most important issue of all – our pursuit of a common and equal citizenry to finally build one nation and move forward together. It was also an obstacle to the development of the iTaukei themselves. The unfair distribution of lease monies which favoured the chiefs deprived ordinary iTaukei people of the share they were entitled to. My Government put a stop to that by regulating the equal distribution of lease monies. And this has not only empowered ordinary iTaukei but strengthened the chiefly system by removing a source of conflict and latent resentment. Madam Speaker, in 2007, the GCC was suspended and five years later, in 2012, it was removed from the regulations that established it in the first place. And I make no apology for it. Because it benefited the country and – as I’ve indicated – also benefited our chiefly system in Fiji. Our chiefs retain their titles and position in the vanua. The Opposition leader is still Na Gone Marama Bale Na Roko Tui Dreketi. The fact that GCC, the institution has not met makes no difference to her status. And she and other chiefs continue to play an important role in the lives of many of our people. Ro Teimumu is a politician so she can expect a degree of rough and tumble in political life. But her traditional role as a high chief continues outside this House. Most chiefs have actually benefited from the abolition of the GCC. And let me tell you why. By placing them above politics, we have increased the mana of the chiefs of Fiji. They are now more respected because we have removed them from the political fray. And they can once again focus on their traditional roles and be a force for unity rather than division in our national life. Madam Speaker, the more enlightened chiefs accept that we are now a meritocracy in which every citizen enjoys equal opportunity. And they don’t want the GCC reconstituted because they recognise that removing them from politics has strengthened their position in the vanua. Less conflict. More respect. No politics. Madam Speaker, four years after the door closed once and for all on the GCC, only the Opposition wants to open it again. To wind back the clock. To restore the power and privileges of the elite. Because SODELPA is the party of the elite. It puts the privileges of some Fijians before the rights of all. Madam Speaker, we on this side of the House opposed this motion and defeated it for a very simple reason. The GCC was undemocratic and completely out of keeping with our new democracy. While those opposite try to restore the power of the elite, we insist on upholding the rights of everyone. While those opposite hanker for an age of privilege for a tiny minority, we are empowering every Fijian to fulfil their dreams and fulfil our nation’s destiny. Above all, Madam Speaker, we insist on the supremacy of this House. Our Parliament. The democratically elected House of the people. And we stand resolutely for a Fiji not gazing backwards to an age of elitism and privilege for some, but a modern nation with its eyes set firmly on creating a better future for everyone. Madam Speaker, I appeal to SODELPA and the three NFP members who make up the Opposition to play a positive role in and outside Parliament and become more relevant. Put aside those attitudes that are more rooted in the 19th century and join the rest of us in the 21st. Fix your eyes on the future and not the past. The chiefs are here to stay. We discontinued the institutionalised and politicised Great Council of Chiefs to strengthen the chiefly system in Fiji. And that system is stronger and more relevant today than it has ever been because our chiefs are now above politics. Our chiefs can no longer be compromised. In fact, the removal of the GCC as an institution is not in contravention of the ILO Convention on the Protection of the Rights of Indigenous and Tribal Peoples. Madam Speaker, the removal of the GCC has and will lead to a more effective governance of the iTaukei people and to a more effective marriage between democracy and culture. Madam Speaker, just because we no longer have the GCC does not mean our chiefs do not exist. Our chiefs are here. 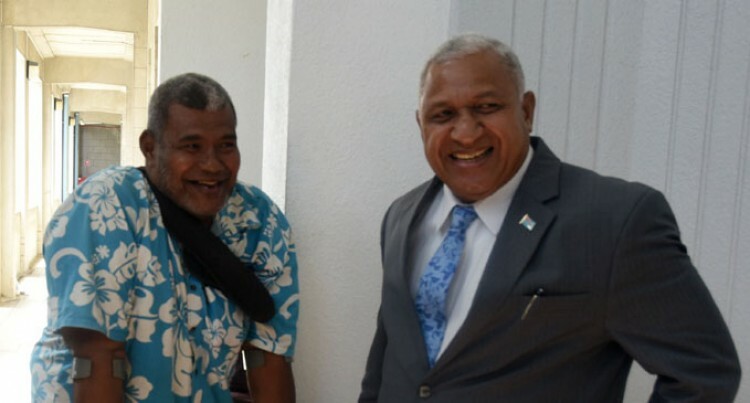 They are much more likely to be secure in the hearts and minds of the iTaukei, and indeed other Fijians, if they command respect and lead by example – if they are forces for unity rather than division. And Madam Speaker so long as that happens, there will always be a chiefly system in Fiji.